By purchasing this product you receive from us 27 points that correspond to the amount of: 0.00 Euro. The collected points can be used to purchase products in our store. Whether you are new to contact lenses or an existing wearer, CooperVision® Biofinity toric is designed to meet the most demanding needs of those with astigmatism. As a wearer with astigmatism, it is important that your contact lenses offer outstanding stability to overcome symptoms such as blurry vision. 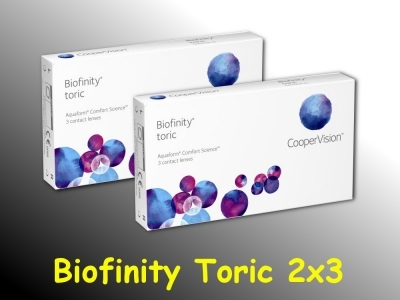 Biofinity toric has an optimised lens geometry that orientates consistently and predictably. These contact lenses are only on order. We don't have them in our magazine.